Having a difficult time choosing a gift for your friends and loved ones? 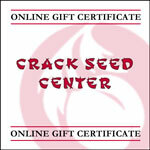 Our new online gift certificates make a great holiday gift or thank you gift! Gift certificates can be purchased in any denomination between $5.00 and $5,000.00 and are emailed directly to the recipient. Please note that gift certificates can only be redeemed online. Click here to purchase an online gift certificate.